Architecture was born in our prehistory. Around 12000 BCE humans had spread most parts of the globe. So that, they started to establish new civilizations and small villages near the caves and along the shores. Because these new settlements were especially suitable for farming and hunting. As a result of this civilization, they started to discover a lot of things according to their daily life needs. First of all, they tried to understand and learn the climate of their new settlements because it is the most significant information for them. Because they were spending their life by hunting and farming. And they found a way of handing down the information to the next generations. On the other hand, they developed the specialization of the building according to their importance and purposes such as religious and communal. As a result of that, architecture gained importance and developed. Before this developement of settlements hunter-gatherers established some centers that they could travel travel from far away. Nabta Playa is one of the important examples of these ritual centers. This site was different than a normal Stone Age site. Because it contains a set of stones that were built according to the purpose of organizing the time of seasons. The other significant stone age site that the book thouched upon is located in Urfa in Turkey. This temple called Göbekli Tepe. Göbekli Tepe site includes several circular stone walls. the temple arises from these circular walls which contains detailed paintings of reliefs on them. And it known as the first temple of the whole world. Throughout the time, humans built their habitats in the mountain regions. One of the most productive of these habitats whic has been mentioned in the book is Mesopotamia. This site is located in the borders of Turkey like Göbekli Tepe. 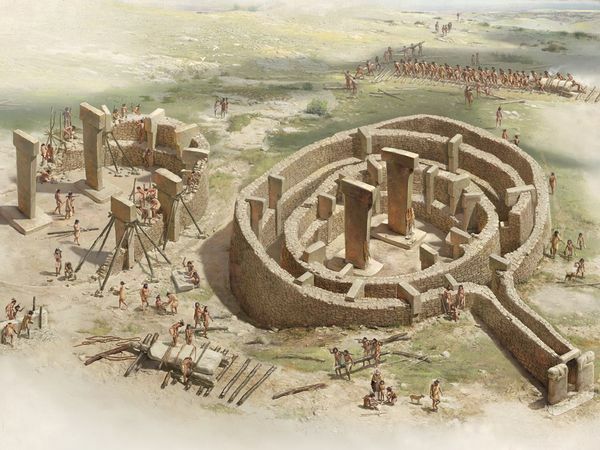 However, it differs from Göbekli Tepe in terms of the climate. Because of the difference of this climate vegetation cover and breeding differs as well. So that, farmers lived in the valley unlike the society. Throughout the time, Mesopotamia became the largest network of villages in the world around 5000 BCE. The basic building material of the buildings in Mesopotamia was timber and mud. The walls of the houses were covered with the honeycomb pattern to increase its durability. The archeologists found wild sheep skulls, at the houses, attached to the plastered walls like in the Çatal Höyük. Çata Höyük is located in the central Anotolia, Konya. The location of Çatal Höyük is known as the oldest center of the metal trade. The site is composed of the houses with rectangular flat walls and the entrance was onf the roof. And also city did not have any streets because it was composed of the adjacent masses (houses). The windows were located in the rooftop so that daylight penetrating from those small openings. These are the brief informations that have sticked in my mind when I read the book of Francis D. K. Ching & Vikramaditya Prakash, A Global History of Architecture. This entry was posted in ARCH 221 and tagged architecture, history. Bookmark the permalink.